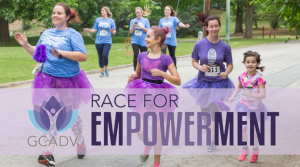 2019 Race for Empowerment 5k and Wellness Expo will be held Sunday, April 28 at 9 am at Piedmont Park! Please create a team, come out this spring for an awesome, family-friendly event! On April 28, the Georgia Coalition Against Domestic Violence (GCADV) is hosting its 5th Annual Race for Empowerment (RFE) 5K Walk/Run and Wellness Expo at Piedmont Park. This family event supports GCADV’s work with domestic violence programs, survivors, and their families across Georgia. Our mission is to collaborate, advocate, educate, and empower! Festivities include a DJ, face painting, t-shirts for all runners, and more! The Wellness Expo is open to the community and will include free health, fitness, and nutrition info. Providing free training and support to member shelters and programs to ensure that they provide the care and services needed by victims and their families. Managing the statewide 1-800-33-HAVEN Crisis Line to ensure all victims and survivors are able to access immediate help and assistance. Engaging in special projects that directly impact survivors such as the Rapid Rehousing Program for homeless survivors and their children and Economic Empowerment Program for survivors in need of establishing a sustainable financial foundation. We hope you will support this event by sponsoring, volunteering, and/or participating! For more information, please contact Hannah at 404-209-0280 ext. 24 or hillies@gcadv.org.